The new weekly PES 2015 Live Update of December 11, covering the week from December 1 to 7, is already available to apply inside Pro Evolution Soccer 2015. This week's PES 2015 Live Update affects a total of 59 players' overalls, including the likes of Lionel Messi, Cristiano Ronaldo and Lucas Moura. As with the previous three PES 2015 Live Updates, for the new PES 2015 Live Update (11/12/2014), Konami again added many new transfered / youth players for teams from all leagues, including the likes of Pablo Hervías (Real Sociedad), Juan Muñoz (Sevilla FC) and Mamadou Tounkara (SS Lazio). 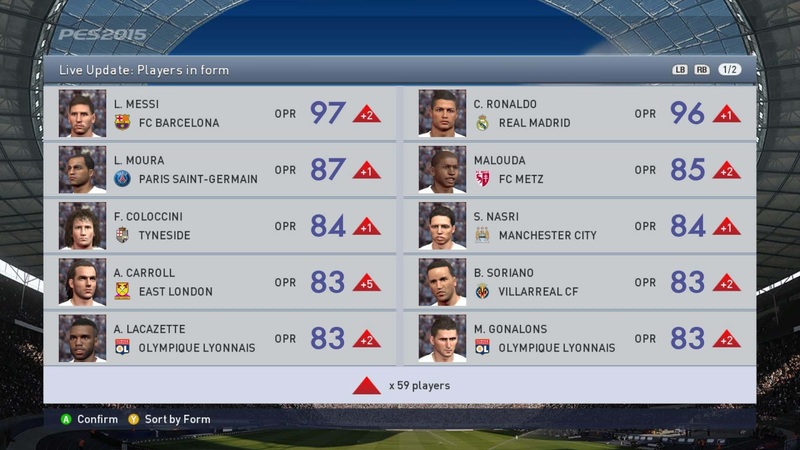 Once again, both Lionel Messi and Cristiano Ronaldo received significant upgrades and are currently rated 97 (+2) and 96 (+1), respectively, in PES 2015. Lucas Moura of PSG was also boosted and now is now at 87 after his good performance in Paris Saint-Germain's last league game. Other important changes include Florent Malouda, Fabio Coloccini and Samir Nasri, while eight players were downgraded today. Lineups and tactics for all teams in the top leagues have also been updated with latest changes in this week's Pro Evolution Soccer 2015 Live Update.